Sonoma County has the reputation of being an environmentally conscientious community. Today, April 18th, 2015, on the 45th anniversary of Earth Day, the high percentage of residents who own “EVs” (both hybrids and all-electric vehicles) is a testament to the commitment of Sonoma County’s citizens to practice what they preach. Many have voted –with their dollars—to “walk the talk” of reducing our carbon footprint. But an investigation into EV purchases for city fleets by the Sonoma Independent reveals a disconnect between the words and actions of most of the city governments in our county. Researching city records for this article was often like pulling teeth: most cities, it seems, have never been asked by local media to disclose how many EVs were in their fleet. What we learned is that at a time in which nearly every candidate for local city council expresses a commitment to helping reduce carbon emissions, only three cities in Sonoma County—Santa Rosa, Windsor, and Healdsburg– have been adding electric vehicles to their fleets. Meanwhile, during the past five years, the city governments of Petaluma, Rohnert Park, and Sebastopol have purchased dozens of new gas-powered vehicles with our tax dollars—but not bought a single hybrid or electric vehicle. Sonoma and Cloverdale have never purchased an EV for their fleet. Our county government, on the other hand, has established itself as a national leader in greening its large fleet of vehicles. A recent issue of Government Fleet magazine (yes, there is a trade publication for this topic), reported, “Sonoma County and the Sonoma County Water Agency purchased 27 vehicles through the program. The addition brings the county’s alternative fuel fleet vehicle total to more than 300, encompassing more than 30% of the agencies’ cars, vans, and light-duty trucks and creating one of the largest plug-in hybrid electric vehicle fleets in the country.” Clearly, Sonoma County is walking their talk. The people of Sonoma County have done their part by purchasing more than 1,500 EVs since a state rebate tracking system began in 2010. Citizens in the Sebastopol zip code topped the county list of EV car purchasers by a long shot, with eight per thousand people. That rate is double the next highest city, which was Petaluma, and four times the EV purchase rate of Santa Rosa and Windsor. During the past ten years, the private sales of EVs in the United States has doubled, and with a new generation of all electric plug-ins and charging stations, sales are expected to soar in the coming decade. The City of Santa Rosa leads the county in its adoption of EVs. It has one of the largest clean burning alternate fueled city fleets in the State of California, with about 100 EV or compressed natural gas vehicles, representing 10% of its fleet. Windsor excels among the County’s smaller cities, actively implementing its detailed “Town of Windsor Greenhouse Gas Emissions Reduction Action Plan Update 2012.” The plan calls for fleet changes “to save over 1,300 gallons of fuel annually, resulting in roughly 11.5 metric tons of CO2e avoided.” Windsor will have 12 EVs out of 117 vehicles in their fleet. Six of them will be purchased this year. Healdsburg, which in 2011 adopted a policy entitled “The Zero Emission Vehicle (ZEV) Program,” also continues to order EV’s for its fleet,including an all-electric Chevy Volt. Healdsburg’s fleet of 55 vehicles now contains 5 EV’s. The “City of Sonoma Greenhouse Gas Emissions Reduction Action Plan” of 2007 also announces noble goals. But like the resolutions passed by a number of other Sonoma County cities, deeds have not followed words. City of Sonoma plan states, “Battery powered electric vehicles pose opportunities for cost savings and enhanced convenience.” Yet eight years later, a review of Sonoma’s 47-vehicle city fleet reveals that they have not yet purchased a single hybrid or EV. For the county’s second largest city, the Petaluma General Plan 2025, passed in 2008, encourages EVs. But a public records request yielded a vehicle fleet list showing just four hybrids out of a fleet of about 220 vehicles. Not one EV has been purchased during the past six years. Sebastopol has been the most outspoken city in the county in its support for EVs, which is consistent with the green political leanings of the city’s electorate. Sebastopol was the second city in the United States to vote in a majority Green Party City Council. 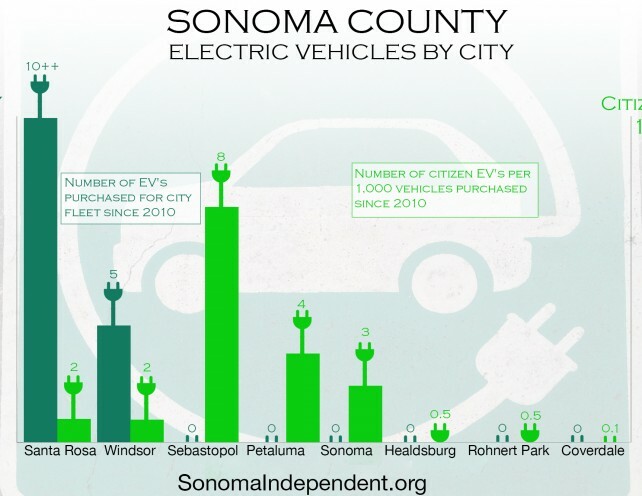 And its residents purchase EVs at more than double the rate of any other Sonoma County city. Yet for a place that some citizens like to call the “greenest city in America,” Sebastopol has just three hybrids in its city fleet, all of which were purchased more than six years ago. Last summer, Sebastopol spent $66,000 buying two Ford F-250 trucks, with 15-mpg fuel efficiency, for its Public Works Department. To this day, a small municipality less than two miles square, with speed limits of 25 mph, does not have a single electric or hybrid vehicle for its parks. Unfortunately, Jacob’s response is indicative of the widespread deference, by elected city representatives entrusted to oversee taxpayer spending, to the policy preferences of city staff. Despite multiple public resolutions by city councils, it is the decisions of unelected city staffers that guides environmentally impactful actions like vehicle purchases. City councils within Sonoma County are quasi-volunteer positions that cost representatives far more in time and expense than their compensation of about $300 per month. While council members come and go with each election cycle, the city staff is the permanent government. And full time department heads, with few exceptions, seem to insist on procuring gas vehicles, reflecting their personal preferences, often without regard to clearly expressed council resolutions. This is where citizen involvement and oversight can strengthen the council member’s hands in managing the city staff. A good place to start would be greater transparency and accountability. The posting of a detailed vehicle fleet list on each city’s website—and public announcements of upcoming purchase plans—could make an important difference. After all, it’s our planet—and our tax dollars. I feel like Sebastopol of all places could use a lot more electric vehicles. Why hasn’t the city purchased more? Great article! My next car is electric! I am hoping for a 200 mile Nissan Leaf in 2016. This car would be a complete game changer for electric vehicles. That said, hybrids perform great in a city environment so why not even a few of those? It is great to see the citizens of Sebastopol out in front on purchasing electrics and hybrids and sadly not surprising to see the city council running dead last. This is the same with the hospital where the counsel all opposed its reopening and the citizens are making it happen. We are awaiting response from the council members from the other two cities who have fallen behind in their stated commitment to prioritize purchase of EVs for their city fleet. Sebastopol is not the only city that is not walking their talk on EVs, they’re just the bottom of the charts of Sonoma County in terms of the cognitive dissonance between the tall talk and the short delivery. I have no personal beef with Robert Jacobs. He just drew the short straw by being the only Sebastopol council member to respond to this reporter’s question, for which he was commended. There are a lot of other politicians who need to answer for their record on this issue.